The fashion startup myProfashional (myprofashional.com) is hosting a clothing swap in Zurich together with lifestyle blogger Slavia Karlen (wo-men-talk.ch). Stylists will help to sort out the "beautiful mess" and provide real-live styling tips on sight! You are cordially invited to join - it's for free! 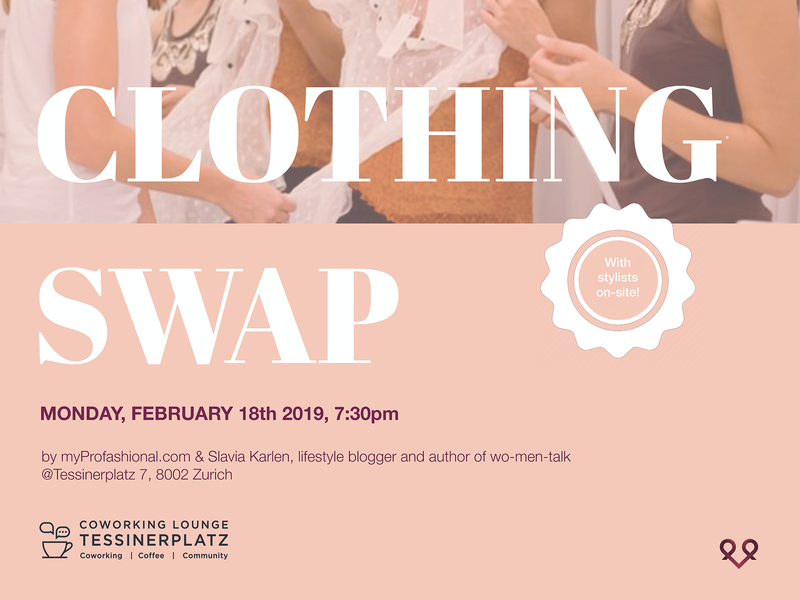 You may think of a clothing swap as an indoor garage sale that is put together as people join. For the most part, we are just clearing off the bar area of our co-working space at Bahnhof Enge and move a few coffee tables into the room. Our "Profashionals" on sight, who are educated stylists, will group the things as good as possible while people arrive. Yet, we don't stress too much about this part, it’s going to get beautifully messed up anyway as people “shop”. But they will make sure you leave happy and well-dressed with a new piece of clothing. If you would like to participate, please don't show up empty-handed! That's the only rule of the game. All the left-overs at the end, will be packed up and donated to Goodwill! Are you in the mood to start your spring cleaning in February and learn more about myProfashional? Then join us on Monday evening, the 18th of Feb at Tessinerplatz 7 as of 7:30pm. Please bring 1-5 pieces max. Only clean and "proper" clothes will be accepted to swap - accessories, bags or scarves are welcome as well!